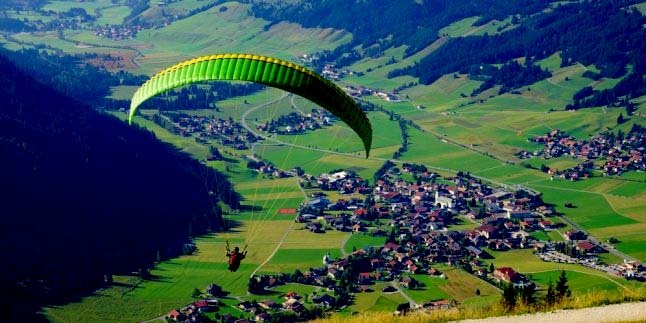 Paragliding Tour in Batu Malang City is the most favorited sport by domestic and foreign visitors to explore the exotic of mountain landscape and green view. Paragliding in Malang, is started from Mount Banyak then finished in Songgoriti lowland. Paragliding itself is directly adjacent to Pujon District and certainly close to other interested places around Malang City. If you have planning to enjoy Malang City tour for paragliding sport on Mount Banyak, make sure You must choose the best time or You can visit Our contact for information especially about Paragliding Package and the weather information. The most heavy visitors normally on Saturday or Sunday because this time normally most local people take the vacation. This Paragliding sport can be enjoyed for all ages from 15 to 60 years old. less than 15 years still must be considered by their parents. Paragliding at Malang Batu City will be treated by natural scenery that extraordinary appearance from the top of Mount Banyak. You can also look around the town of Batu which is full of different kinds of beauty. Paragliding at Batu is known as the best place to admire the nature attraction by flying in Java Indonesia with satisfaction and resionable price. If you are interested to try this flying sport, You can start your journey from Surabaya Airport for duration 3 hours, From Banyuwangi is 7 hours and from Malang is 30 minutes. Batu City is a part of Malang Regency, Most visitors spend their time for Paragliding Malang, after They finish enjoy Mount Bromo tour package and other nature tourism in Java Island Indonesia. Beside Paragliding Sport, We also provide other interested place around Malang City, Such as Omah Kayu Malang (Tree House) with the wooden house facility, Jatim Park 1 and Jatim Park II, Coban Rondo Waterfall and Balekambang Temple. Batu City also popular as the place of Apple Plantation, Flower Plantation, Durian Fruit and Banana Fruit. You will not only offered How to pick a fruit in Apple Palntation but also possible enjoy Apple Crips and other Fruit Crips. Beside Paragliding Tour in Batu Malang City. If You have more time, You can take Mount Bromo tour package option below. If you are interested to enjoy the combination holiday between Paragliding tour Package, and Mount Bromo Tour Package, You can visit Our contact for detail package price and facility.